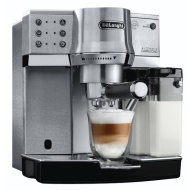 alaTest has collected and analyzed 350 reviews of Delonghi EC 850.M. The average rating for this product is 4.3/5, compared to an average rating of 4.4/5 for other products in the same category for all reviews. Reviewers really like the noise and performance. The maintenance and price are also appreciated, whereas there are some mixed comments about the size. We analyzed user and expert ratings, product age and more factors. Compared to other products in the same category the Delonghi EC 850.M is awarded an overall alaScore™ of 85/100 = Very good quality. The machine looks great. Easy to follow instructions. Can tailor your coffee to suit your own taste. The milk does not get hot enough. Not all cups will fit under the machine. Taller latter glasses don't fit under the nozzles. We get around this easily by using a jug and decanting the latte into the pre-warmed glass.